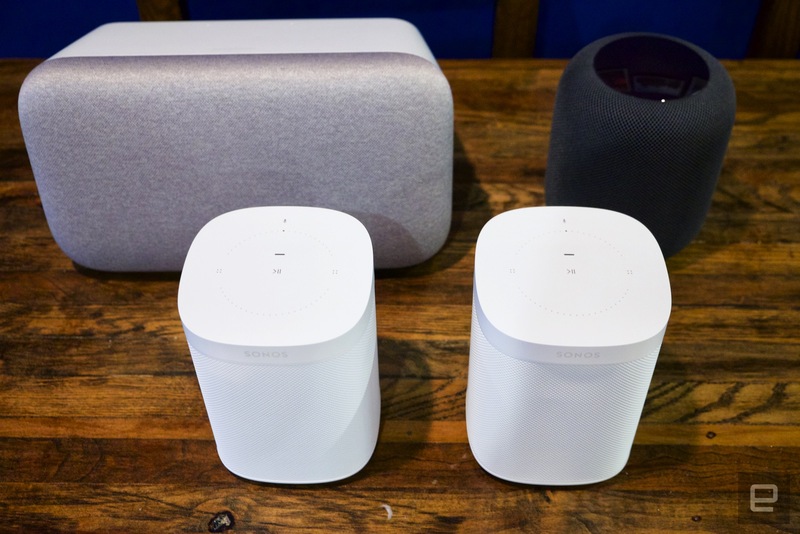 Choosing between Apple's HomePod, Google's Home Max and the Sonos One is no small task. If you're a music fan, the first wave of smart speakers was probably a disappointment. While Alexa and Google Assistant have definitively proven they have a place in the home, the first Echo and Google Home devices were unimpressive when it came to actually playing music. They did the job in a pinch, and being able to command Spotify with your voice is a killer feature, but many longed for better-quality audio. Fortunately, that call has been answered. In the past six months, Sonos, Google and Apple have all released music-first speakers with voice assistants built in. There's no doubt that the Google Home Max, Alexa-powered Sonos One and Apple HomePod all sound far better than just about any other voice-powered speakers out there. If you value audio quality above all else (and have about $400 to spend), what's the right smart speaker for you? Let's break it down. For the purposes of this story, we compared a single HomePod ($350), two Sonos One speakers ($350 total) paired in stereo and a single Google Home Max ($399). While the prices are in the same range, you'll get different speaker components with each set. Each Sonos One includes a single tweeter and one mid-woofer to cover both mid-range frequencies and bass. The Home Max answers with two tweeters and two large 4.5-inch woofers. The HomePod has perhaps the most unusual arrangement: seven total tweeters (each with its own amplifier), along with a single woofer that points straight up. To compare the speakers, we set them up in the same room, made sure each was running the most current version of its software and, in the case of the Sonos One, ran the TruePlay tuning software, which adjusts audio quality for the room and placement of the speakers. The HomePod and Home Max both tune themselves automatically; there's no way to control that part of the audio equation. In all cases, we left EQ settings on default. Finally, we used an Apple Music subscription for the HomePod and Sonos One, while Google Play Music provided audio to the Home Max. Song choices trended toward modern rock, indie and pop, although we sampled songs from every decade since the 1960s. Lastly, although I did most of the listening, a number of other Engadget editors lent their ears and feedback to this review. There wasn't a clear, unequivocal winner among the three speakers tested; rather, each speaker showed its prowess in different situations. 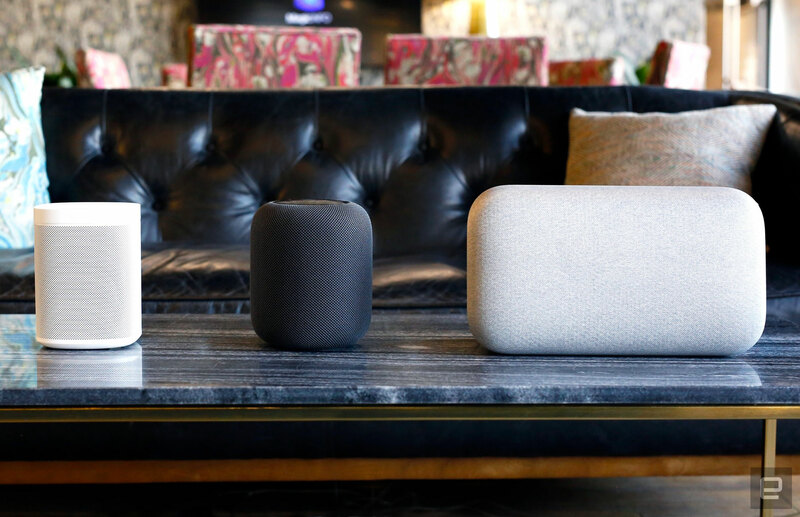 Chris Ip, our features editor, did a comparison listen between all three speakers and preferred the HomePod's rendition of Beyoncé's "Countdown." Specifically, Ip is a fan of prominent bass, and the HomePod's woofer elevated it over the Sonos One. The Home Max also provides strong bass, but it didn't reproduce mids and highs with the same precision. That was the story across the board with the Home Max. Its strengths come from two places: bass and volume. At louder volumes (think 75 percent or higher), it sounds better than a pair of Sonos One speakers; the lack of bass means the One ends up sounding shriller than the Home Max when you crank it up. 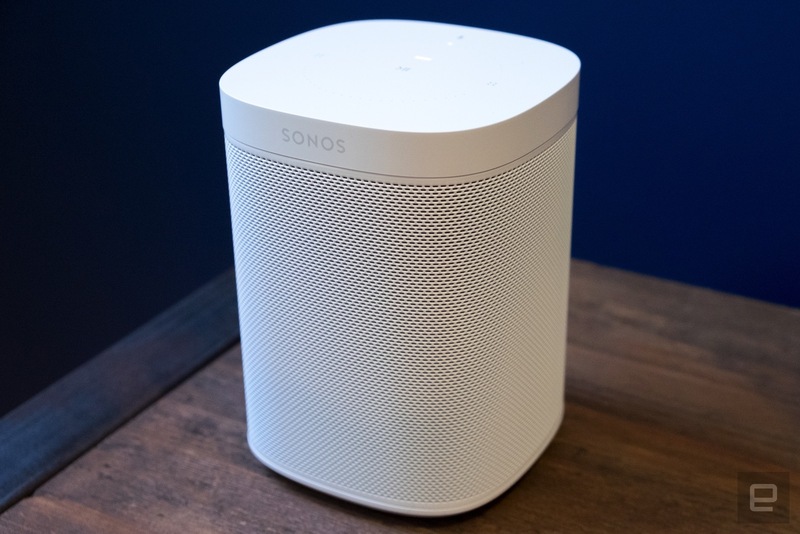 But both the HomePod and Sonos One offered better overall clarity across the range of songs we tested. The bass doesn't feel as well regulated on the Home Max; while the HomePod does a great job of adjusting bass levels to match the room and the speaker's overall volume level, the Max's overall sonic picture is muddier and less distinct than the competition. As mentioned, the Sonos One is the speaker most lacking in bass here; pairing two of them together helps a bit, but it just doesn't reproduce the physical, table-rattling, chest-thumping sounds you can coax from the Home Max and HomePod. 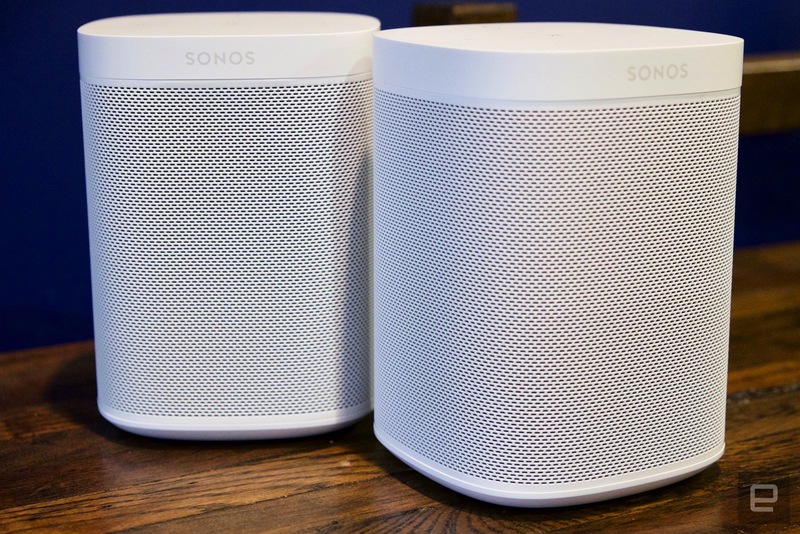 However, spending $350 on a pair of Sonos One speakers opens up a number of audio experiences that just aren't possible with the other speakers we looked at. By virtue of being two separate speakers you can place anywhere you want, the pair of Ones naturally did a far better job of reproducing a wide stereo soundstage. The Home Max and Home Pod do a better job of this than they should, but it's still not the same as having true stereo separation. And if you're more interested in multi-room audio, two One speakers will give you that option for a lot less money than getting multiple Home Maxes or HomePods (which don't even have stereo pairing or multi-room audio capabilities yet, though Apple says its speaker will this year). There wasn't a definitive winner between the paired Sonos One speakers and the HomePod. When listening to Metallica's "Master of Puppets," I preferred how the HomePod added a nice low end to the frantically chugging guitars; the One felt like it lacked the power needed to make the song hit home, particularly at higher volumes. But Sonos did a great job at reproducing the psychedelic soundscape of Pink Floyd's "Shine On You Crazy Diamond." For plenty of other songs, it was truly difficult to pick a winner. Executive editor Dana Wollman did a blind test and couldn't decide which speaker did a better job playing back John Coltrane's version of "My Favorite Things," while senior editor Kris Naudus was similarly torn picking between the HomePod and Sonos when listening to "Cherry Tulips" by Headlights. 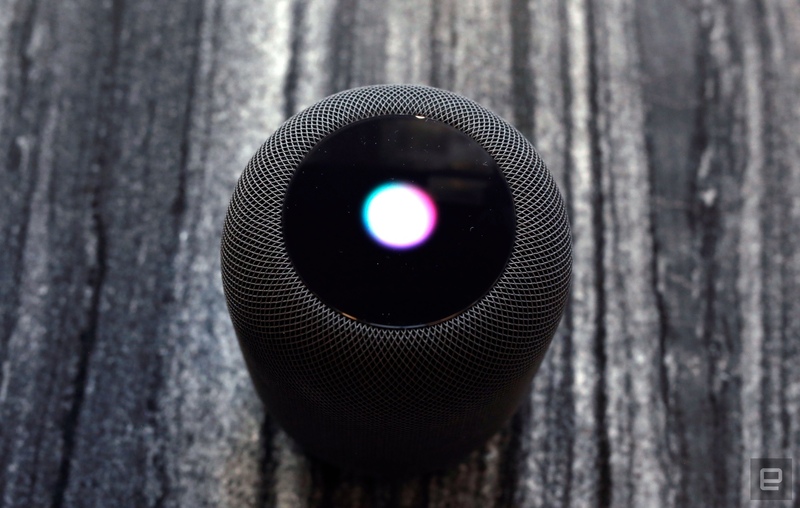 Along with senior editor Chris Velazco (who wrote our HomePod review), I spent hours bouncing songs back and forth between the speakers -- everything from the swirling trip of Beck's "Colors" and the continually shifting soundscape of the Radiohead classic "Paranoid Android" to Carly Rae Jepsen's over-the-top hit "Cut to the Feeling" and the electronic glitches of "Such Great Heights" by the Postal Service. Throughout our listening, we were never able to fully write off either the HomePod or the Sonos One. Ultimately, though, I give a slight edge to the HomePod -- it has significantly better bass reproduction, but I wouldn't describe it as an overly bass-heavy speaker. It just makes it a lot easier to hear every aspect of the song the way it was intended to be heard, bass included. The Sonos One does a lot with lesser specs, and pairing the speakers up in stereo makes for a truly great listening experience. But to my ears, the HomePod more often had the edge. If music were our only focus, we'd be done -- but even if sound quality is your foremost concern, there are still other things to consider before making a decision. Specifically, each comes with a voice assistant that can be used to control audio playback, but Siri, the Google Assistant and Alexa can do much more than that. Additionally, each speaker supports different music services in different ways, so that's another thing to take into account. Plenty has been said about Siri's limitations as a personal assistant on the HomePod. Ditto for the device's reliance on Apple Music. But I think Siri holds its own in a number of situations, specifically finding music. Telling it to just play some music brings up a station populated primarily with music in your library, ensuring you start off with tunes you'll recognize and enjoy. Siri does a good job of fielding queries like "Play me some rock music from the '70s," "Play popular songs from the last decade" or something as simple as "Play me new music I'll like." Initially, the Google Assistant did a horrible job of answering the same questions on the Home Max using Google Play Music. When I asked it to play rock music from the '60s, it played a compilation album called Rock and Roll Instrumentals: 50's–60's that was populated with terrible covers of songs from that period. Eventually, I figured out that I could ask it to play Google's custom radio stations -- just saying something like "Play a station featuring songs from the '80s" would do the trick. Most users aren't going to realize that, initially. Combined, Alexa and Spotify did a solid job answering such requests by pulling up playlists from the service's massive collection. But Siri still gets the edge with music commands; it add songs to playlists or your library as a whole, and you can tell it that you "like" whatever song is playing to improve Apple Music's recommendations. Neither the Google Assistant nor Alexa was able to add songs to specific playlists or my music library for either service, though you can tell Google to add a thumbs-up or thumbs-down rating to songs while using Play Music. It's possible Amazon Music is better supported through Alexa, but far more people are likely to use Alexa and the Sonos One with Spotify. Siri's advantage dwindled once we moved on to other tasks. Overall, the Google Assistant was best at answering general knowledge queries, and it also does a better job of recognizing context in follow-up questions. For example, I can ask who the starting quarterback for the New England Patriots is and then ask where "he" went to college, and it'll know I'm still talking about Tom Brady. Siri and Alexa could also answer these questions, but they didn't have as much context awareness. Setting alarms, adding reminders and checking the weather all worked equally well, but Siri falls down when setting timers, because you can set only one at a time. Siri also can't add things to a calendar, even though it can do so on iOS devices. Both the Google Assistant and Alexa support calendars, but Alexa ultimately wins because it supports multiple Google calendars (including Google's own G Suite) as well as Microsoft Outlook and Apple iCloud. Strangely enough, Siri is the only assistant that can take notes; it adds them to the Mac/iOS notes app. Google wins when it comes to using the Home Max as a speakerphone; you can initiate calls with anyone in your Google address book just by asking. The HomePod can take only calls that you start on an iPhone, while Alexa on the Sonos One can't handle calls or messages at all; those features are restricted to Amazon's own hardware for now. Google can't send text messages either, but Siri can. Of course, all of these Siri features are limited to one account, and anyone with access to the speaker can send messages or have the speaker read your texts back to them. Apple really needs to implement some better security features around that, and quickly. All three assistants work with a pretty huge range of smart home devices. If you're thinking of using these devices to control lights, thermostats and more, just do the research first and make sure they're supported by Alexa, Google Assistant or Apple's HomeKit. But at this point, just about all the major players work across all three platforms. Ultimately, Siri's issues weren't entirely a deal-breaker for me; I don't have any smart home devices yet, and I don't use voice assistants for much beyond basic interactions. But it's hard to ignore Google and Amazon's lead here. And if you can't choose which virtual servant you prefer, Sonos has promised it'll add support for Google Assistant on the One. Right now, Alexa is the only option, but if you prefer Google you'll be able to just switch over. Additionally, the One will work with AirPlay 2 when Apple releases it. So while you can't currently control Apple Music on the Sonos One with your voice, AirPlay 2 should enable owners to talk to Siri on an iPhone to play music over the One. While the Sonos/Alexa combo supports only a handful of music services with voice control, Sonos' own controller app lets you use virtually any music service you can think of. With the Home Max, you're limited to a small set of services with voice control; after that, you can send music via Google's Cast technology through supported apps, or just use Bluetooth or a 3.5mm audio cable. Finally, the HomePod works with Apple Music or iTunes purchases almost exclusively, as we've all heard. However, in all cases, you can use basic voice commands to get some additional functionality out of services that aren't supported by these speakers. You can AirPlay songs from Spotify and other services to the HomePod, and then use voice commands to skip tracks, play, pause and change volume. With the Sonos One, you can start playing songs from any service using the controller app on your phone or computer, and then use Alexa voice commands to play, pause, adjust the volume or skip tracks in the queue. And the Home Max offers the same commands when you're casting audio from other apps. There's a lot to like about all of these speakers, even Apple's locked-in HomePod. For most potential buyers, any of these will likely be a huge upgrade over using your laptop, pack-in headphones or a battery-powered Bluetooth speaker to listen to tunes. Of the three options we tested, a pair of Sonos One speakers is the best choice for most people. Despite a relative lack of bass, the One consistently reproduces songs clearly, and having two speakers makes for a much better stereo experience. I personally prefer the Google Assistant, but Alexa is a strong voice option. And besides, the One will support Google before long anyway. That said, if you're a fan of bass, both the HomePod and the Home Max are worth considering. If you're deep in the Google ecosystem and use Google's own services for music, the Home Max won't disappoint. And the millions of people paying for Apple Music will appreciate the HomePod's excellent fidelity and Siri's general smarts when it comes to finding music, even if Siri isn't as good an assistant as Google and Alexa. But for the millions of Spotify users who want to talk to their speakers and get excellent audio quality, the Sonos One delivers. It sounds great now, and Sonos promises to keep improving it over time. 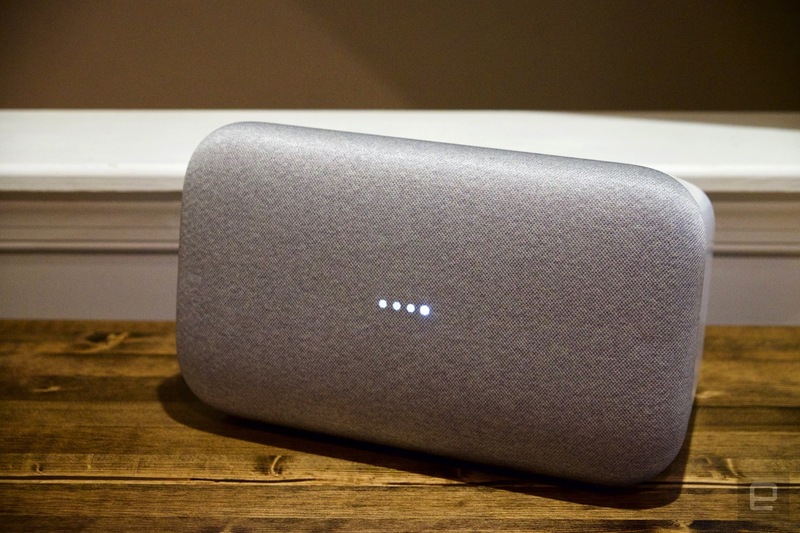 Whether that's more music services or the forthcoming Google Assistant support, buyers should feel confident the speaker will actually get better over time. And they're a great first piece in a bigger, multi-room audio setup as well. A pair of Sonos Ones should delight all but the most die-hard Apple or Google fans -- and even those people would probably find a lot to like with these speakers.